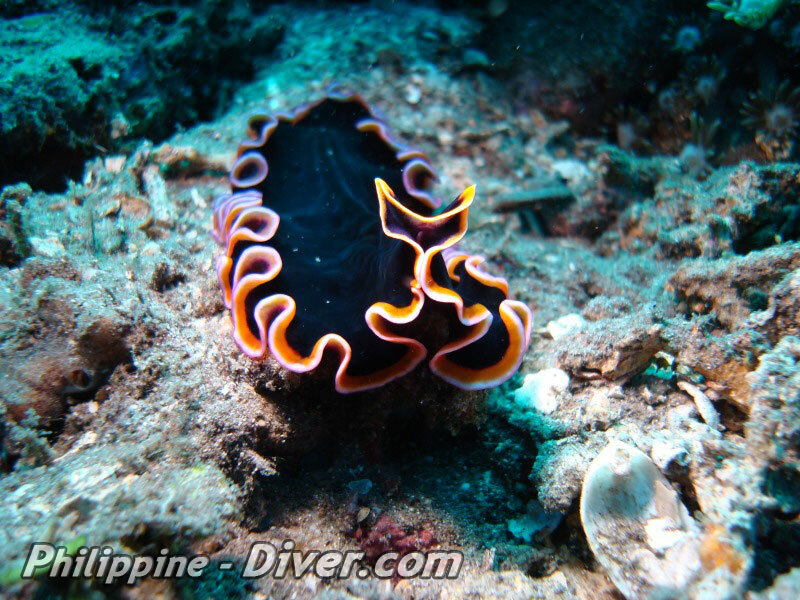 Diving in Apo Island was the star of the Visayan dive spots for years. In 2011 and 2013 two typhoons hit the Island and the Marine Sanctuary got hit hard. However, the small part is only one of the dive sites at Apo Island, which is a protected area by itself, and to tell the truth, not one of the top-spots anyway. Its fame came from the very shallow corals and the options for snorkeling. 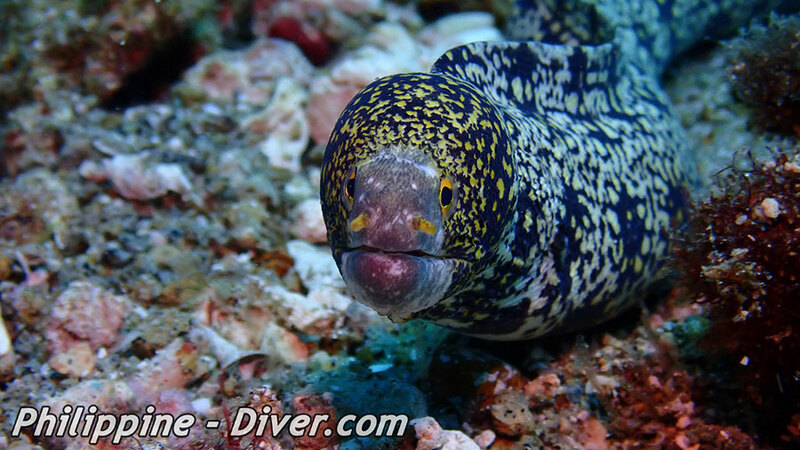 Most other dive-sites remained undamaged and offer simply some of biggest diversity of corals and aquatic life you will ever see in your scuba diving life. 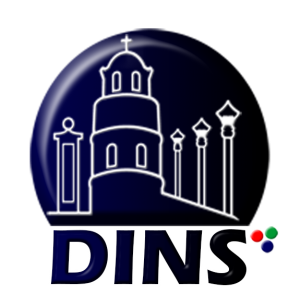 This dive site is located directly in front of Apo island and gets its name from a nearby small church. It is made up of a very gentle slope of sugar white sand and patches of mixed coral heads. Then it suddenly drops off into an impressive wall with many overhangs and small caverns to explore. Clouds of colorful reef fish can be observed on the reef crest while Clearfin Lionfish and White-Eyed Moray Eels can be spotted among the overhangs and crevices. Spiny Lobsters, Nudibranchs, Fire Dartfishes, Sailfin Gobies, and Blue Ribbon Eels are also regularly sighted. A wide array of Gorgonian Sea Fans are found here, closely related to, but technically not coral, themselves. Individual tiny polyps form colonies that are normally flattened and branching, and reminiscent of a fan. Many Tube and Finger Sponges can be found along the wall as well as golden colored Leather Corals with their impressive shimmering polyps. There is also a small cavern at about 20m/65ft that provides excellent photo opportunities due to the colorful coral hanging down and the Midnight Snappers that are often seen lingering around the entrance. Several very fortunate divers have even spied thresher sharks on this site. Turtles are common and Sea snakes can often be found on the top of the wall. 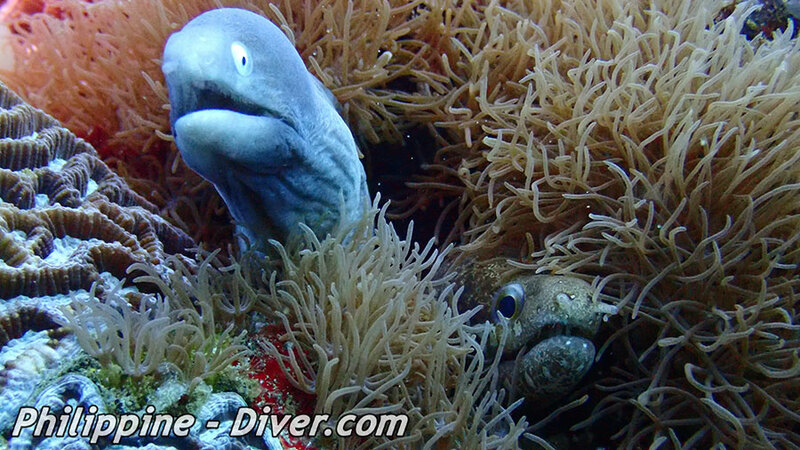 A very rewarding dive for all levels and macro lovers will also find plenty to see. Due to the prevailing swells that are usually present, this site is often referred to as the “Washing Machine”. 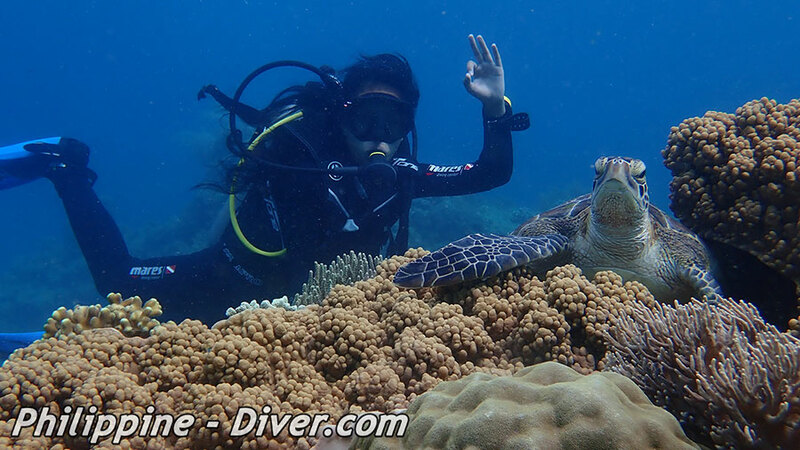 Unless dived at slack tide or during certain phases of the moon, when it can be suitable for novices, this site is strictly for advanced divers with drift dive experience. The up and down currents here can be fairly challenging and it is certainly not for the faint-hearted. This current, however, can also be an advantage as it transports plankton and can create a whole new experience in its wake as the marine life follow the food. In which case, there is a high probability that you may see a large school of Big-Eye Trevally, opportunistic solitary Giant Trevally patrol for any chance of an easy meal as well as Midnight Snappers, Barracuda, Spanish Mackerel and Dogtooth Tuna. Kaleidoscopic clouds of Anthias and Fusiliers are always present finning furiously against the current. The magnificent Whale Shark, the largest fish in the ocean, has been known to make an appearance here on rare occasions. 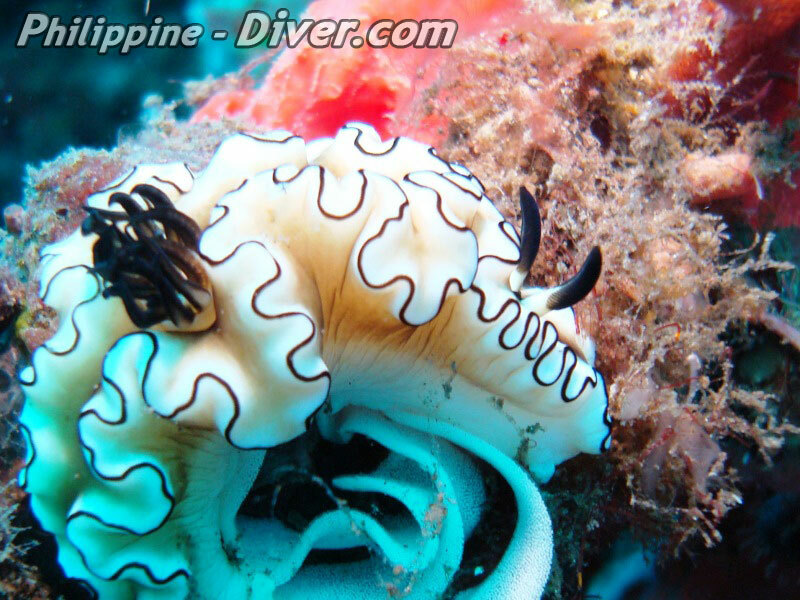 Cogon Point is similar to Coconut point in that it is subjected at times to a strong current, which makes this a thrilling drift dive only suitable for more experienced divers. Entry is at the buoy near to Olo point, the northeastern corner of the island, as near as the local fishermen will permit. The dive begins on a sloping reef where an excellent mix of corals and sponges are found and ends along a wall carpeted with luxuriant soft corals. The fierce currents also guarantee a remarkable congregation of marine life with huge shoals of bigeye trevallies cruising out in the blue. If the current allows you may be able to swim out and join the throng and they will readily surround the diver to make you feel as though you are one of the pack. This is a great site for observing the immense and majestic Manta Ray, some species of which can grow up to 7m in width and if the swim above you can block out the sun! When feeding, mantas unroll their cephalic fins to channel food into their mouths and the plankton is then collected by the tissue between the gill arches. Turtles are also commonplace here and if the currents calm down a little it is possible to explore overhangs and crevices to find shrimps and eels. Mamsa, in the local Visayan dialect, means jack fish (trevally) and here is an excellent place to observe these schooling predators. The resident school of Big Eye Jacks forms aggregations consisting of hundreds of fish as they patrol the reef. This species is commonly observed in these large schools, sometimes stationary or at other times slowly spiraling around the reef complexes that they inhabit during the day. At night, the schools dissolve, and the species become active, taking most of it during their active nocturnal period. Entry can be challenging due to high waves with a formidable downstream current to a maximum depth of 38m. The topography here is comparable to Cogon, so a sloping reef leading into a steep wall, which is adorned with Hard and Soft Corals. Barrel Sponges, Tube Sponges, Anemones and Crinoids are all numerous and like all of Apo’s dive sites, multi-colored smaller tropical reef fish dance in the current. Other pelagic species to look out for are Dogtooth Tuna, Spanish Mackerel, and Rainbow Runners. The Giant Trevally, a powerful apex predator in most of its habitats, is also found here and is known to hunt individually and in schools. Males become black once they mature. 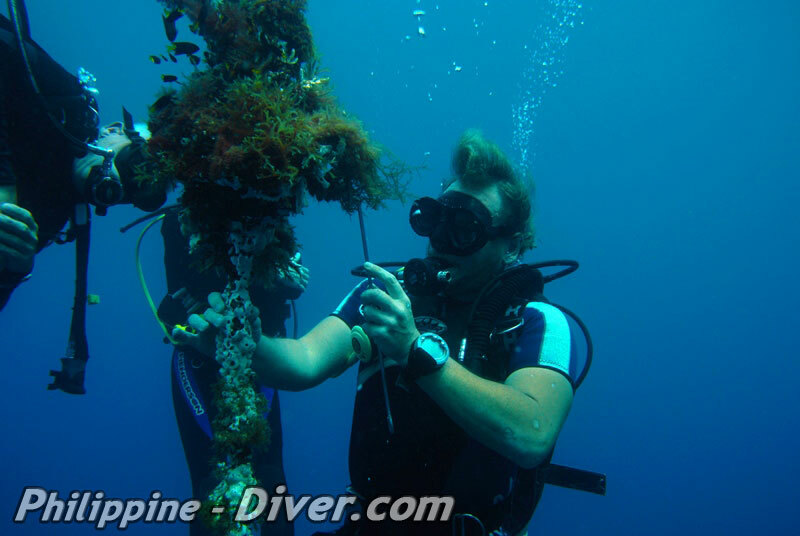 Generally only suited to advanced divers with experience in drift diving. Rock Point East starts in the bay south of the main beach on Apo Island and is made up of a finger-shaped reef that juts out from the SE corner. Its close proximity opens it up to strong currents and this promises an incredible array of marine wildlife. The east side is a steep wall leading down to a plateau at the very tip of the point where allowing for currents, divers can choose to either continue to the west side or turn around and explore the east wall. 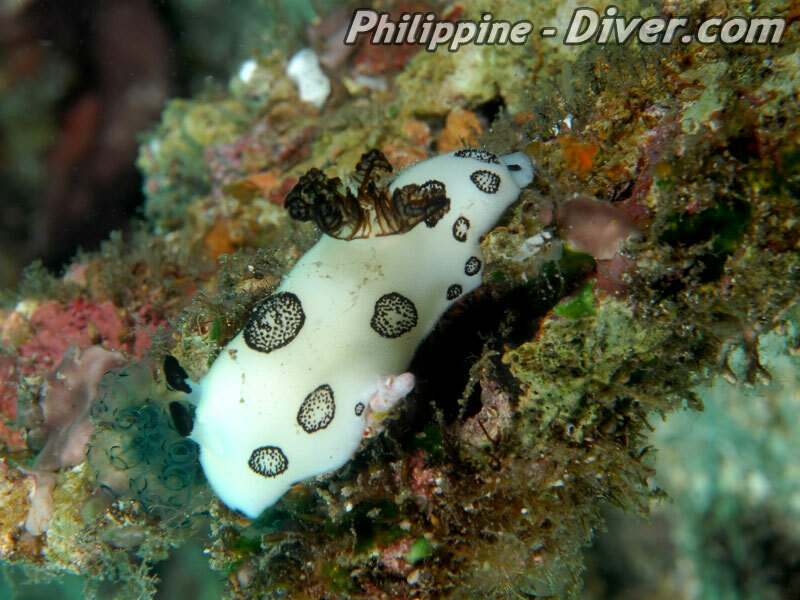 The dive site consists of a large finger-shaped reef protruding from Apo Island’s South East corner. Its proximity leaves it exposed to stronger currents, which ensures incredible fish life and Coral formations, as well as the occasional visit from larger pelagics during plankton blooms. Clouds of kaleidoscopic reef fish such as the tenacious Anthia are omnipresent and there are many macro subjects to be found hiding in nooks and crannies. Schooling Fusiliers, Butterflyfish, Surgeonfish, Longfin Bannerfish, and Red-Toothed Triggerfish are abundant. Occasionally Giant and Bluefin Trevally can be observed in hunting mode. As with all other sites on Apo Island, there is always a good chance of finding Turtles and Sea Snakes. This dive can also be made in shallow depths to fit the requirements for novice divers which means there is something here for everyone. Not to be missed. 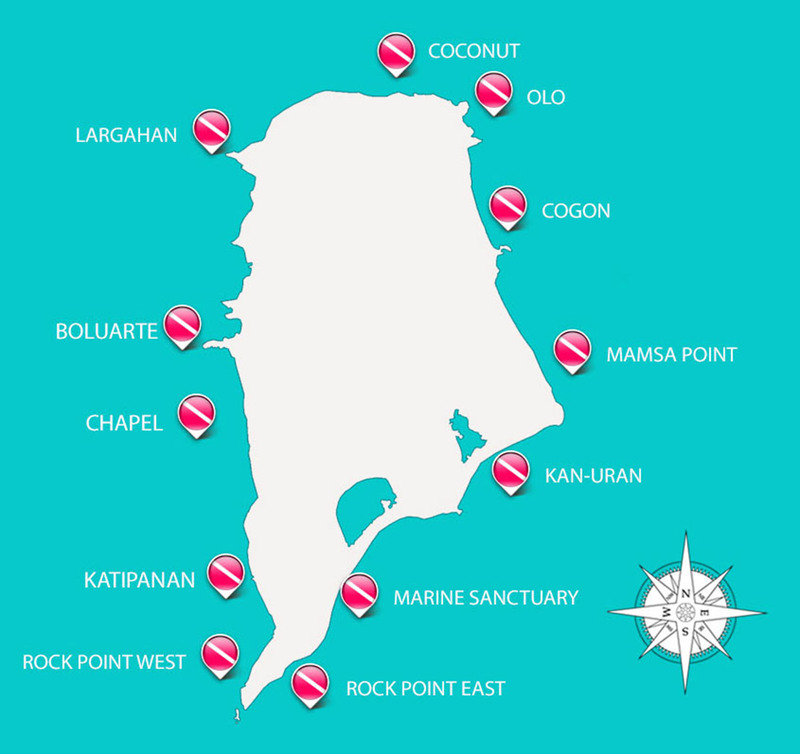 Rock Point is the southern tip of the island which points towards Mindanao The west side is a steep slope and you can choose to dive on the eastern or western slope, depending on the current. The shallower sections are carpeted in a luxurious Soft Coral forest, home to some of the healthiest and most prolific Corals on the planet. Hawksbill Turtles love to dine on these as one of their favorite foods, so there is good chance you will spot one of the residents happily grazing. Giant Frogfish habitually perch on the top of the sponges and Longnose Emperors often pass by. 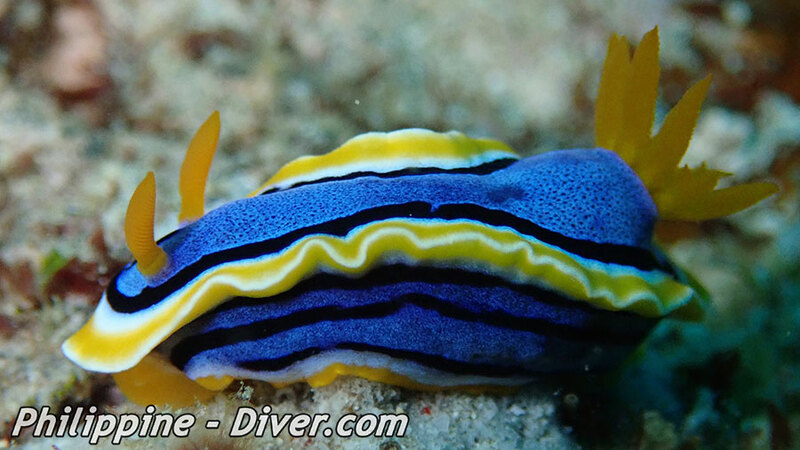 A rich diversity of reef fish are ever present and macro lovers will find a wide variety of Nudibranchs and Flatworms. The current is fairly moderate at the beginning, however it can be variable and may increase rapidly towards the promontory. Here, groups of fish such as Redtooth Triggerfish, Schooling Bannerfish and Pyramid Butterflyfish alongside Unicornfish, surgeons and fusiliers can be surveyed cruising in the prevailing surge. Katipanan is named after the small Cowry Shells that are often found on this site. Diving at this location is typically easy with the moderate current taking you over a soft coral garden housing a rich variety of marine life. This site can be dived from either direction, either in the direction of Rock Point West or towards Chapel Point, effectively making it two dives in one. The gentle slope is punctuated with huge Brain Corals and Lettuce Coral meadows as well as numerous colorful Soft Corals swaying with the current. A great dive on Nitrox when Turtles, iridescent Cuttlefish, Dart Fish, Harlequin Sweetlips, Trigger Fish, Butterfly Fish, Goat Fish, Angel Fish, Bat Fish, Surgeon Fish and hordes of damsel fish crowd these waters. Kan-Uran offers a very nice wall dive with some exceptionally good corals, which both the hard and soft varieties in evidence. The dive begins with a steep slope gradually developing into an oblate area. Plenty of overhangs and ledges to explore where you may come across many varied Nudibranches, Razor Fish, Rubble Pipe Fish, and Spot-faced Moray Eels their mouths gaping as their heads protrude out of their dens. 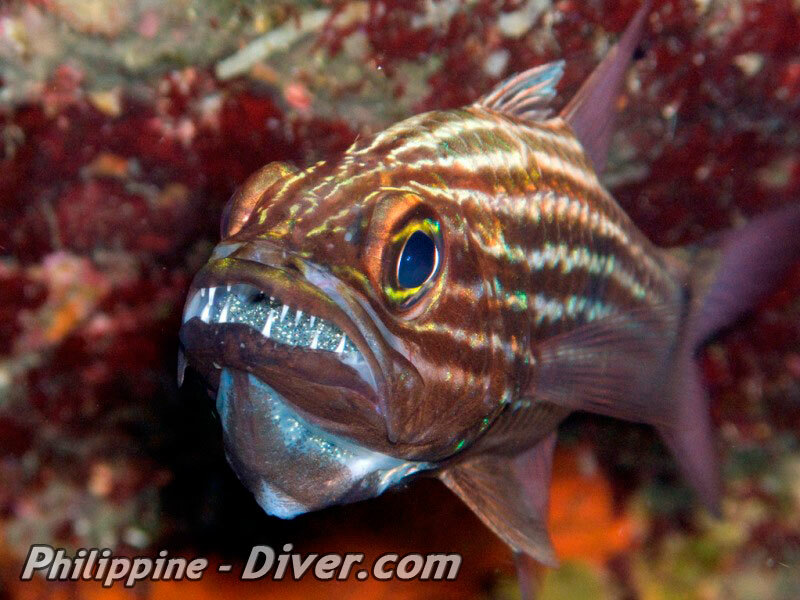 Sailfin Gobies may be located on the sandy ledges of the wall and large Malabar Groupers, Midnight Snappers, Surgeonfish and Bignose Unicornfish are all frequently spotted. The elusive Radial File Fish can sometimes be seen here. Filefish can alter their color and pattern to match their surrounds in order to deter predators. Although closely related to the Triggerfish, their dorsal spine cannot be locked into place. Visibility can be changeable here and therefore it is not recommended for inexperienced divers as this destination requires advanced open water diving skills. The volcanic nature of the island is once again in evidence at this location, as shown by the steady streams of bubbles erupting from the darkly colored sand. The wall here is colorful, the coral healthy and the diversity of fish and invertebrates is among the best on the planet. A gentle dive site with minimal to zero current and a varied topography. The wall is followed by a sandy slope and there are some pretty Hard Coral formations in the area. 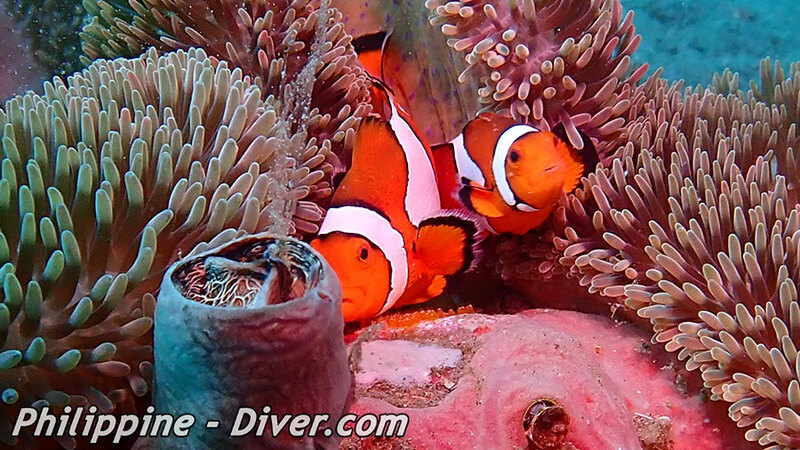 Clownfish are abundant as well as their host sea anemones. These two species have a symbiotic relationship, each providing a number of benefits to the other. A myriad of other tropical reef fish swim by and you may also be fortunate enough to see the occasional Green Turtle and Banded Sea Krait. If your air lasts long enough, a little further down the coast it is possible to observe larger pelagics such as Tuna and Barracuda. Sharks and Eagle Rays are also frequently observed. As this reef is in excellent condition it also hosts tiny pygmy seahorses and frogfish as well as an abundance of huge gorgonian fans and well-developed whip corals. A hugely varied site with hard coral formations interspersed by black volcanic sand. Ledges with deep undercuts are prolific and a fair sized wall at about 10m drops down as deep as 35 m plus. Halfway along the spacious cave is situated with a large gorgonian sea fan suspended from the roof. A beautiful soft coral garden is located in the shallow area with one of the highest diversities of coral species in the world. Nearby volcanic activity is strongly evident here and delicate streams of bubbles rise out of the sand due to underground geothermal activity. Typical species to be found here include Bignose Unicornfish, Bluefin Trevallies, Black and White Snappers, Pyramid Butterflyfish and a host of Fusiliers. Nearby there are several sections of small staghorn coral where a group of secretive Mandarinfish congregates and there are also regular sightings of contrasting Nudibranchs, Flatworms and the occasional Frogfish. Searching in the multitude of nooks and crannies and you may come across Ribbon Eels and Scorpionfish. Later as you reach the shallower part of the dive, you cannot miss the largest living bivalve Mollusc on the planet, the Giant Clam. By day, the clam opens its shell and extends its mantle tissue so that the algae it uses for nutrition can receive the sunlight they need to photosynthesize. A sizable school of Yellowtail Barracuda patrols the shallows and divers can approach very closely until completely enveloped by the ball of fish. The dive finishes on a small sandy area with Blue Razorfish and Ring-Tailed Surgeons often spotted.